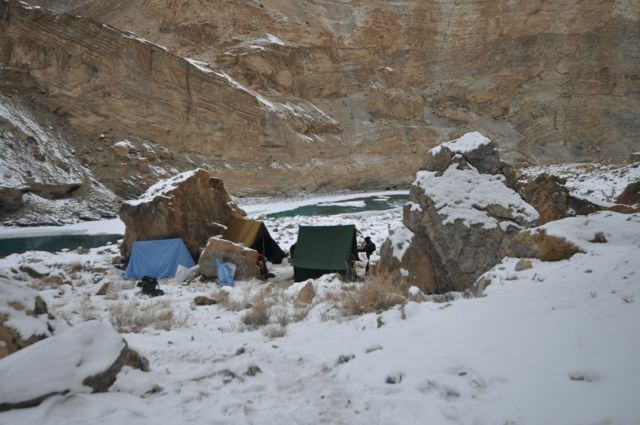 *The journey starts at The Chadar Trek Journal – Julley! *You can find the previous part here. The next day, I rose to sunlight and a roaring fire. An entire stem of a small tree, along with a couple of branches had been put to the torch. Thus it was that as my fingers thawed and my toes returned to normal, I told Ruchi that I wasn’t really sure about going ahead, but I wasn’t sure about turning back either. In the light of the Sun and the warmth of the fire, all resolve of going back had melted away. Ruchi said that she would join us if we decided to turn back, and Ut made it clear that he, on an obvious note, will accompany Ruchi in her decision. Without Ruchi and Ut, things would have changed. But Kartik did not want to turn back any more. His cough was much better, he said, and he wanted to go ahead. Thus, Mansi, Manisha and Bisu decided to leave for Leh, and we, a group of ten now, decided to carry on the forward journey. Bidding goodbye to Manisha (center); Notice the big log at our feet – this was the log which was burning when I had woken up. Thanks to it, I continued further. The earlier day, when we were planning the further trip with Gyanji, we had made lofty promises of starting at 8, so that we could make up for the lost time. Now he laughed, looking at us not completely ready even at 9.30. We were packing, Anuj was sleeping till late, and Ruchi was preparing Mansi for the return trek to Tilat as best as she could. She wanted to give her an injection, but even the injection fluids were frozen. It had to be thawed by Vaka’s warm hands before it could be injected. And hence, at 10:00 AM, we began our trek. The destination of our hopes and dreams was a camp site called Dibb, which had a cave to sleep in. But to reach there, we had to cover, in a day, a distance that was traditionally covered in a day and a half. We decided to give it our best. It was cloudy, and the forecast was that it will remain so all day. Shortly after we started walking, we came across an area where the ice and snow had melted away. There was no option left, other than circumventing the area by trekking over the mountain around it. There was one extremely difficult climb at the beginning of the intended mountain trek, but after climbing that, the rest of the trek wasn’t too tough. 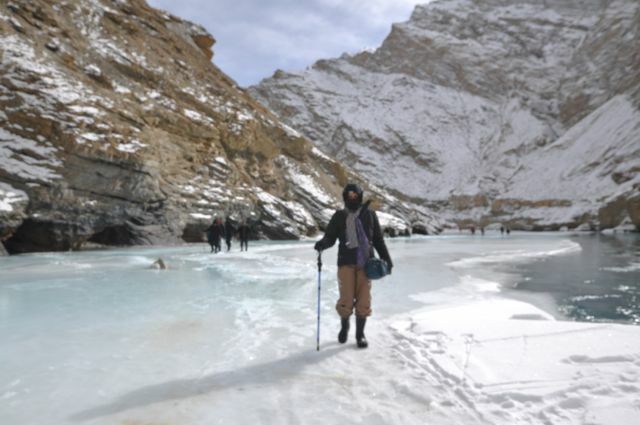 Soon after we crossed the mountain, we came across a vast stretch of ice without any snow covering it. With baby steps, we started walking over it. A little ahead though, there were thin sheets of ice formed over half a foot deep water (which rested on a really thick ice layer). 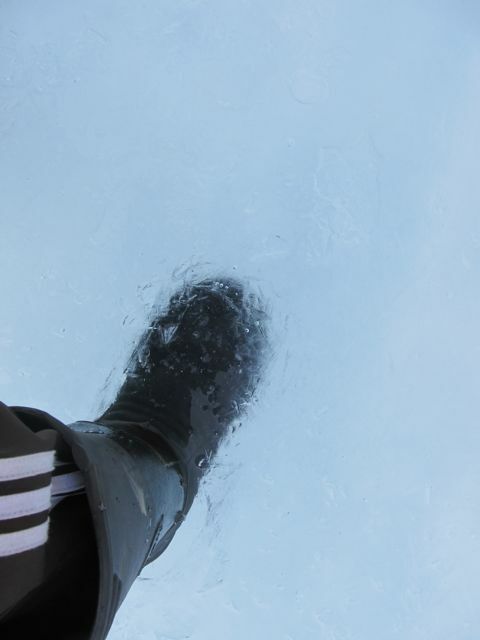 As we walked, literally, over thin ice, the ice broke, and our feet landed in water on slippery ice. Blessing Gyanji for the life saving gum boots, we waded through the water, through hundreds of ice chips, over ice that was thankfully very much solid. 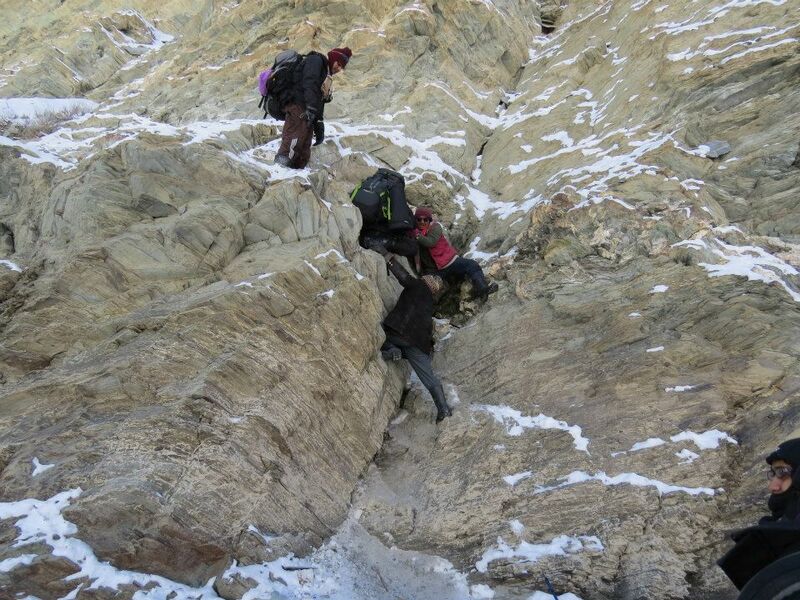 After lunch, we started with renewed vigour, but soon we encountered another molten patch of the Chadar. 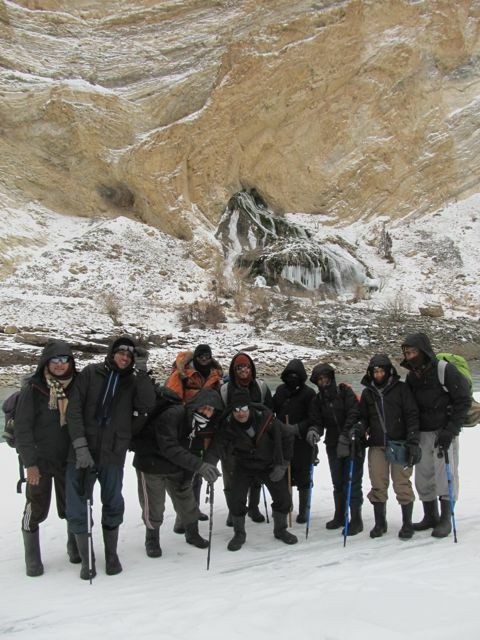 This time, the trek over the mountain was fairly easy and we managed most of it without any help from Gyanji. As we walked ahead, we met a lot of small kids going the other way. They were accompanied by their elders, who, in some cases, were so old that we felt ashamed of ourselves. 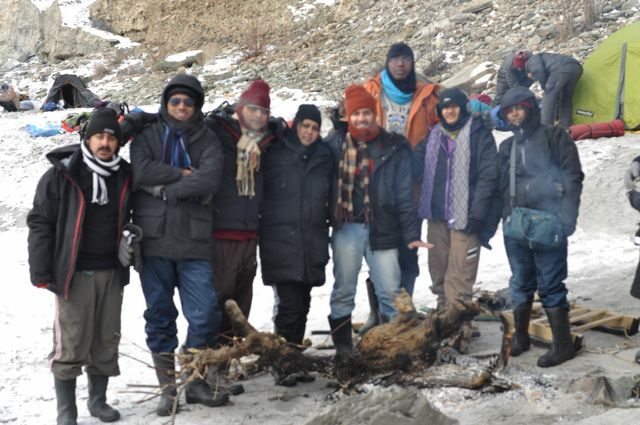 We also met a lot of other Chadar trekkers like us who were on their way back to Leh. 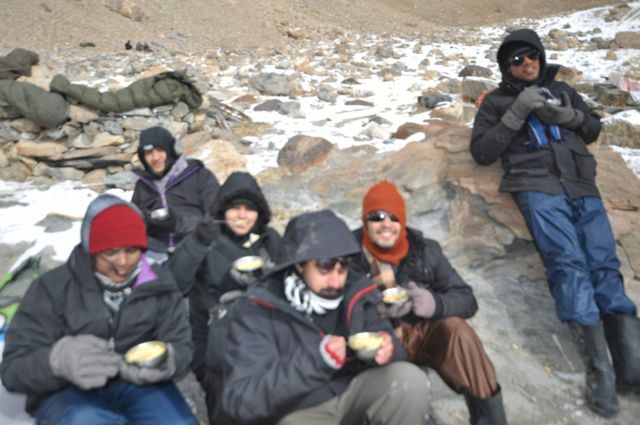 We got used to greeting one and all with a Ladakhi ‘Julley!’ meaning ‘hello!’. The Chadar, desolate though it is, has a social life of its own. 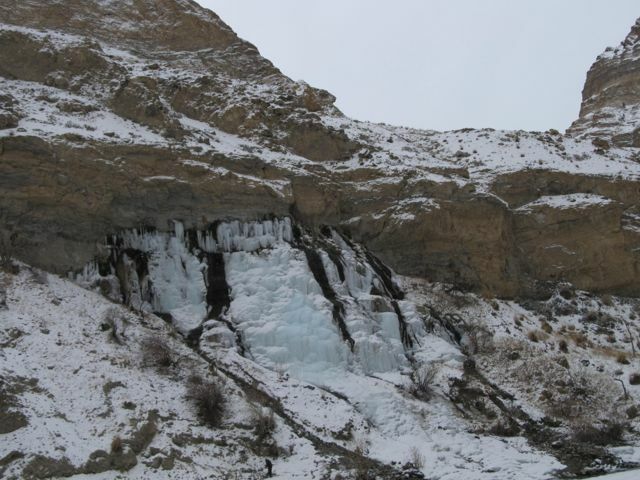 And shortly after we climbed down the mountain, we encountered the first frozen water fall of our journey. It looked as if somebody had waved a wand and the water had just stopped midway and frozen. While waiting for Ruchi and the rest to catch up with us, we clicked a lot of photos.Further down the way, we saw another waterfall which, the Ladakhis say, never freezes. Us, at the second waterfall. Before we knew, it was already 2, and we were still 4 hours away from Dibb. 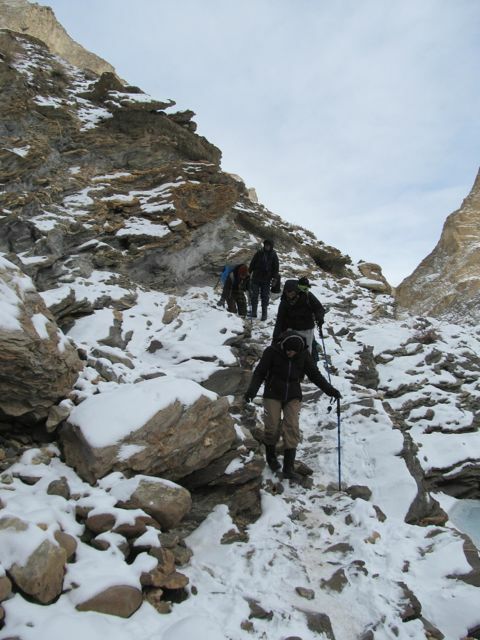 Gyanji deemed a trek after hours to be very risky. He suggested that we make camp at the first chance we get. But camping before reaching Dibb meant that we almost surely won’t reach Naerek, our final destination. However, we decided to pay heed to Gyanji’s word – in the Valley, it seemed wiser to listen to the Sherpa’s experience than to our whims. And therefore, we came to camp at Gsomu. Gsomu was a bit of an uphill climb, so that once you were on the hill top, the river was lost to the view. There were a lot of boulders scattered over the hill, and our tents were being pitched against the boulders, thus giving us a hope of wind protection. 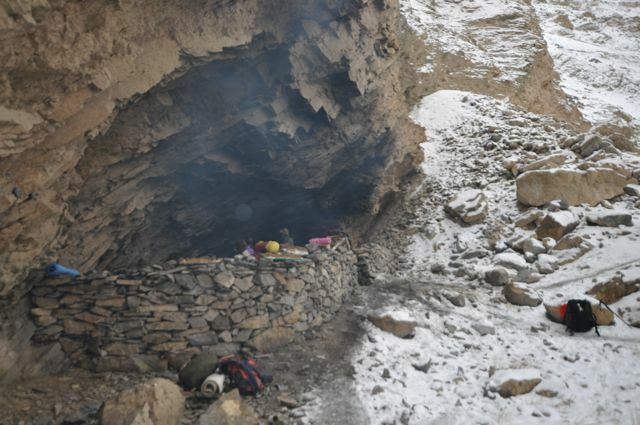 There was also a small cave, and the porters decided to set their camp in it. As no tents could be pitched inside the cave, we didn’t dare sleeping in it with just our sleeping bags. We had decided that we would all stay together and create a jolly atmosphere in the evening – I didn’t want another gloomy night. In the past two days, we had also come to understand the warmth, and I mean the literal warmth, of companionship. So we all decided to sit together for the entire evening, till we went to bed. With just the 10 of us left, we all could easily fit in the girls tent. We sealed the tent against the air outside by blocking all orifices with our bag packs and extra sleeping bags. Hardly had we become comfortable, when they served us piping hot soup and pakode. We all jumped at them like hungry wolves, and within a few minutes, we were asking for more. The good natured cooks got us another plate of their own share, and with gusto, we finished that too. And then Gayatri laid down the Three Choices in front of us. It was clear that it would take a miracle for us to reach Naerek. We could only reach Dibb, and then we would have to turn back. So we would have a new itinerary. The first choice was to start the return journey the next day. Surprisingly, this choice too had buyers – Ruchi, because she thought she had seen and experienced pretty much everything, and Kartik, because he was darn lazy. The second choice was to go to Dibb and come back without staying there, so that we would have one less night to spend. I had proposed this choice earlier, because even though I loved the trek, the memory of the previous night was fresh in my mind. This choice was popular – Gayatri, Ramesh and a few others supported it. The third choice, of course, was to stay a night in Dibb. Dileep and Prarabdh supported this idea vehemently. Finally, after consulting with Gyanji, we arrived at a truce. We will go to Dibb and stay there, but we will not camp at Tilat Sumdo on our way gback. With the decision made, everybody (with the exception of me), started playing Mafia. I decided to do a very bold thing – change into fresh clothes. So while everybody discussed and argued over who could be the damned Mafia, I went to another tent, removed the several layers on my body, applied moisturizer all over, and wore fresh inner layers. I also added an extra thermal inner layer on my chest. By the time I was done, it was time for dinner. We didn’t want to leave the warmth of the tent, so they passed us the dinner plates through the small flap at the entrance. Sitting in a tent, with steam rising from our dinner plates and warming our tent even more, the ten of us comrades had the best dinner of our lives. They had served us rice, rajma and methi – and it was the most delicious rajma I had ever ever tasted. With full stomachs, contented hearts, and warm feet, nobody bothered to wonder how low the temperature outside could be. But the temperature was dropping again, of course. Blame it on some unaccounted air gap, that I started shivering vigorously after dinner. To divert my thoughts, I decided to occupy myself with an Isaac Asimov I had carried with me all the way from Bangalore. Wrapping myself in a shawl, I tried to focus, while the game of Mafia raged on around me. (I don’t like playing the game). Soon, it was time to sleep. Quickly, we ‘made our beds’ and tucked ourselves in our sleeping bags. As always, I covered my nose with my muffler, so that only my closed eyes remained visible to the world. And then, for the first time in three days, I slept. I slept and I dreamt of Mafia. I dreamt of Gayatri, Anuj and Utkarsh playing Mafia with our bag packs as the Villagers. Anuj and Utkarsh wanted to kill Gayatri’s bag because it was so heavy. But Gayatri defended it, saying that the bag had two bottles of Brandy and Rum in it. And then the dream vanished, and I went into a deep slumber again. 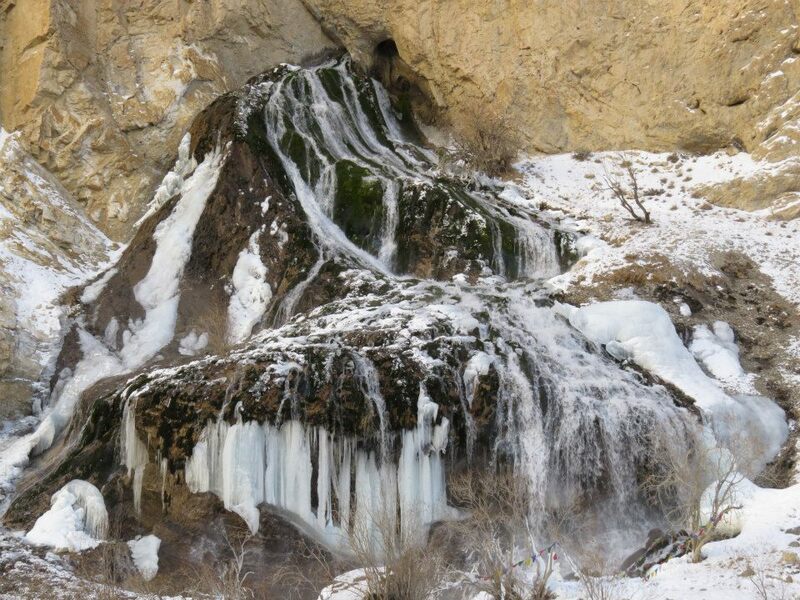 2 Responses to "The Chadar Trek Journal – Day 3 – Shingra Yokma to Gsomu"